I fell in love with Sarajevo last week. But this was no rosy-tinted romance, no naïve foreigner’s passion. Although, it’s true – being a Balkans outsider means I will always be ignorant and unable fully to grasp its historical complexities. I have some dear friends in the city, with whom I’ve been meeting at various points over the years. But this was my first time in Bosnia. And there is a wonderful spirit to the place. Its history is everywhere – with clear remnants of its Ottoman past in the centre, then a sudden break into its Austro-Hungarian period, followed by the cold war era brutalist mass architecture. It was famously called the Jerusalem of Europe – it was a diverse and plural culture. The Austro-Hungarians shrewdly insisted that along the central streets should stand the Orthodox Cathedral, Catholic Cathedral, Grand Synagogue and Central Mosque. But that harmony (a harmony that always masked latent tensions) was often shattered by conflict. And that is what struck me most. Sarajevo is a city plagued by war. I stood at the very spot from which the assassin of Archduke Ferdinand and his wife Sophie fired in June 1914 (roughly where the lady with the red umbrella is standing in the right hand picture below). The Museum is dedicated to the event and its aftermath but was unfortunately closed by the time we got there on Friday afternoon. The archduke was being driven down the main street from the Town Hall after some official function. Standing on that drab, non-descript, narrow street corner beside the river, it was somehow not hard to imagine hearing the shots ring out nearly a century ago, after which Gavrilo Princip the assassin jumped into the river and his eventual death. No doubt in 4 years’ time we’ll be hearing a lot about that spot. Who could possibly have predicted the consequences? Those 2 deaths led to the deaths of between 10 and 16.5 million people during the First World War, the bizarre result of a convoluted web of treaties and agreements. The war to end all wars. Well, Sarajevo stands as the evidence of the absurdity of that claim. The Second World War exposed even more complexities in the Balkans – I’ve only just scratched a few surfaces and am already hopelessly confused about who allied with whom, over what, why and when. But like every conflict, however apparently just or unjust its causes or justifications, the consequences are tragic. Here, then, is another memorial. This time, it stands in front of a classic Austro-Hungarian era building, an eternal flame in memory of the countless citizens of Sarajevo who lost their lives in that war, regardless of their ethnicity and religion. As we walked past, a couple of Romany children took a break from their begging on the freezing streets to warm their hands on the fire. Yet another group of people who seem bound to society’s margins in a city that itself has become a byword for the marginalised. The Serbian siege of Sarajevo that lasted from 1992-1996. 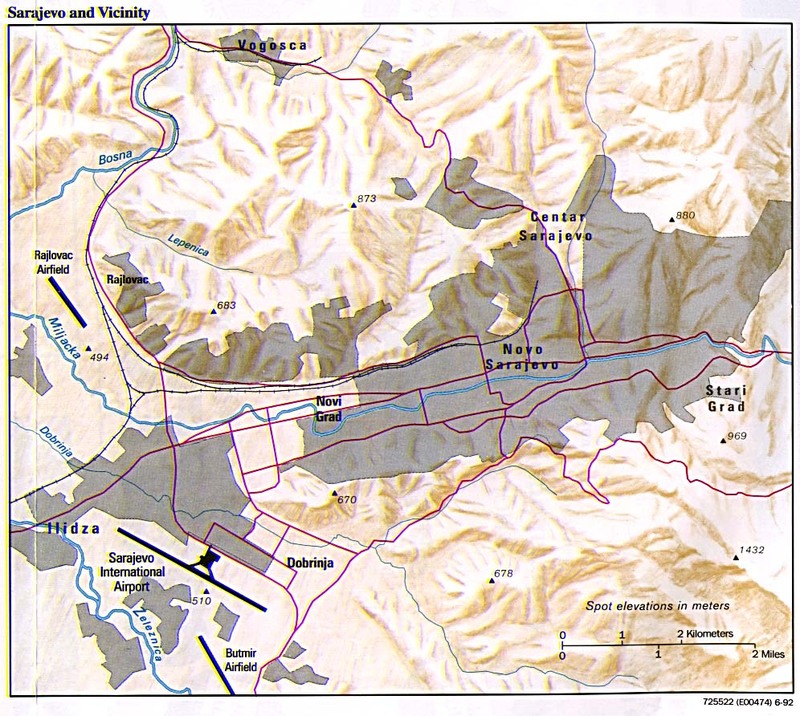 The city is situated in a river valley surrounded by mountains, making its citizens sitting targets for snipers, grenades and mortar fire (see the relief map below – from MapCruzin). I was impressed by how much the city has been repaired and developed in the 14 or so years since the siege’s end. New buildings are going up all the time – although the credit crunch seems to have halted proceedings somewhat. But every now and then, one would come across some buildings remain pockmarked by bullet holes. And everyone I met had stories of having to pelt across streets, cowering behind overturned trucks and trams. It is hard to conceive of living in besieged city in the modern era. I keep on picturing what it would be like to have to do this in London’s streets. One would stay at home as long as possible. But then necessity would enforce risks – not least because of the need to get food. Sarajevo would have collapsed very quickly had the UN not held the city’s airport and thus protected supply lines. But still, getting basic supplies could be dangerous. Below is a picture of the central Meat Market – the scene of two terrible atrocities, when shells landed during market time. The memorial at the back of the building lists the victims of the second shell – a poignant list containing names from all the religious and ethnic backgrounds of the Balkans. In fact, 85% of the fatalities during the siege were civilian. Resurrection Encounters: now out & published by 10ofThose! Really interesting as always. Thanks for this. Mark, Thank you for your post and for capturing something of the essence of Sarajevo and Bosnia Herzegovina. It’s a remarkable country and so complicated, yet maybe the best truth comes from the stories of the Bosnians themselves. What a privillege to have been able to work and serve there, to become part of these people’s lives and to experience the heart of the country. The ‘spirit’ of the country confuses me – there is a wonderful spirit to Sarajevo, standing on the hills looking over the city is an unforgettably, marvellous experience. However, we frequently experienced a heavy, tangible darkness and quenching of the joy of Christ which can only be explained by the absence & rejection of the Lord. It’s a dark country in so many ways – with so much blood spilt, this is surely inevitable. It’s a spiritual battle which has claimed many victims in Christian work and tires/exhausts those who remain. Thanks for this Kendra – i’m always nervous of talking about places I’ve only visited but don’t know well! Glad that it rings at least vaguely true to someone who has spent considerable time there.